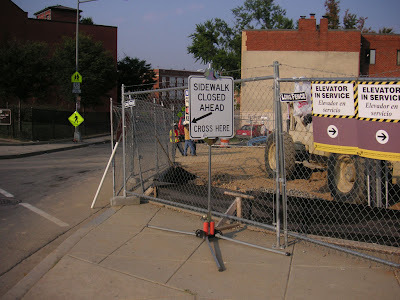 The massive development that DC's been seeing lately has had some unfortunate side effects, one of which is sidewalks (seemingly everywhere) being closed by construction companies. This causes pedestrians to either take long detours or (more likely) take a dangerous walk through the traffic lane of a the road. As DCist reported a week ago, DDOT has announced that they will unveil stricter regulations at the end of October. Let's hope their bite is as bad as their bark and the new regulations can help. In my own experience, part of the problem isn't just practicality - but plain laziness on the part of the developers. Sure, it is more expensive to create covered walkways or work around the sidewalk. But what gets me is situations like the one that I have to walk through every day on my way to and from the Petworth metro. On Rock Creek Church road, the sidewalk is closed for a small stretch which basically drives pedestrians into the street. While the road itself isn't very busy, cars do sometimes come flying around the corner from Georgia Avenue. Visibility is bad because of the construction, so I'm never very comfortable with the walk. But it seems silly to cross the street twice (which puts me in the middle of the road anyway) just for the 50 feet that are closed. 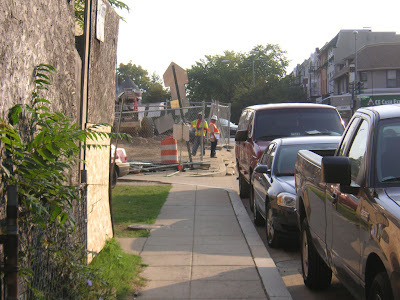 Why on earth couldn't they have just moved the fence back 6 feet and left the sidewalk open? There isn't even anything in the space that is consumed here, as you can clearly see from these pictures. Hopefully these new regulations will save us from this stuff in the future. Above: From the south. Below: from the north. Click on a picture to enlarge.